Has it really been 7 months since I blogged something not on That Recipe? I have been meaning to. I have had dozens of blogs written in my head, but haven’t made it to actually writing them down. And then about a week ago I decided to revive the Random Musings of Aud the Broad… with a few changes. Too many words, too much potential for misinterpretation, not sure it portrayed what I wanted it to (apparently “broad” has a sexual connotation to it in some crowds, who knew?). Since I planned on making some other changes I figured now was the time to make the change. I spent a day brainstorming different names, trying words in different languages, made up words, etc. Some were taken, some were too awkward in English, and some just didn’t do it for me. There was a point when I was having nasty flashbacks to “naming committees” at my former job. Ugh! We would go on for weeks with people suggesting names and others shooting them down or to find someone already was using our perfect name. Don’t miss those days. Finally, I smashed together the words MUsings NOt FOod RElated. I liked it instantly. Simple, pretty, easy to remember, not taken by someone else. Except on Twitter! I forgot to check social media before I registered the domain. Rookie mistake that my former co-workers would be disappointed to know I made. I also set up separate social media accounts from That Recipe for Facebook, Google and Twitter. Instagram and Pinterest can share. They are easy to find – look up to the tippity top of the page. Follow along… I promise lots of fun. I wanted this site to be advertising ready from the start. I surveyed my choices and fell in love with the Graphene Theme. It is free and so customizable, but in a straight forward easy to understand way. I like it so much I think I am going to modify it for That Recipe too. I’ll be making a thank you donation to them! I knew if I was going to continue with this other blog then it had to be moved from Blogger. I am going to be diplomatic and say the difference between Blogger and WordPress is like the difference between iOS and Android or Mac and PC. Some people are very adamant in their choices. They like the way one operates, it makes sense to them and switching is difficult. And some people can be downright rude about their preferences too like Apple users. When I took over the site from my mother it came with a WordPress blog she wasn’t using. So I learned on WordPress. It is easier for me to navigate and I can pretty much do what I want on the platform. And I can choose which image I want for a featured image!!! My biggest pet peeve with Blogger is it’s choice of a featured image. Whether sharing my posts or someone else’s on Facebook or Tsu I get some odd choices of photos. For one blogger it would pull up her image of a Diva cup EVERY single post, regardless of what the post was about or what other images were in the post. In WordPress, I click Featured Image on the right and can choose my image or even upload a new one. I couldn’t get it to work. I scoured the boards for my error message and discovered that it was probably due to my host having an outdated program or two. So, now I had a choice. Pay someone to do the transfer for me ($150!) or find a new host. I am not going to name names. I am not going to bash my former host company. Again, I am going to be diplomatic and just say their business focus is on e-commerce, not blogging. This is not the first time I have had an issue with them. There have been plenty, and I just kept ignoring it because I feared going through the process of changing. I am not going to lie, the process has been a little daunting. Especially on the That Recipe side. As of this writing it still isn’t done. I will have a whole post about the process of switching hosts once it is complete. But since this was a new domain, I was able to get WordPress installed, Blogger Importer Extended installed and all of my posts, comments and images transferred and Blogger to WordPress installed and configured so all of my old traffic now points here. With this last plug in there was only one code that needed to be cut and pasted into Blogger, and the plug-in generates it for you so you don’t need to change “yourdomain” to your domain name like many other solutions I read. 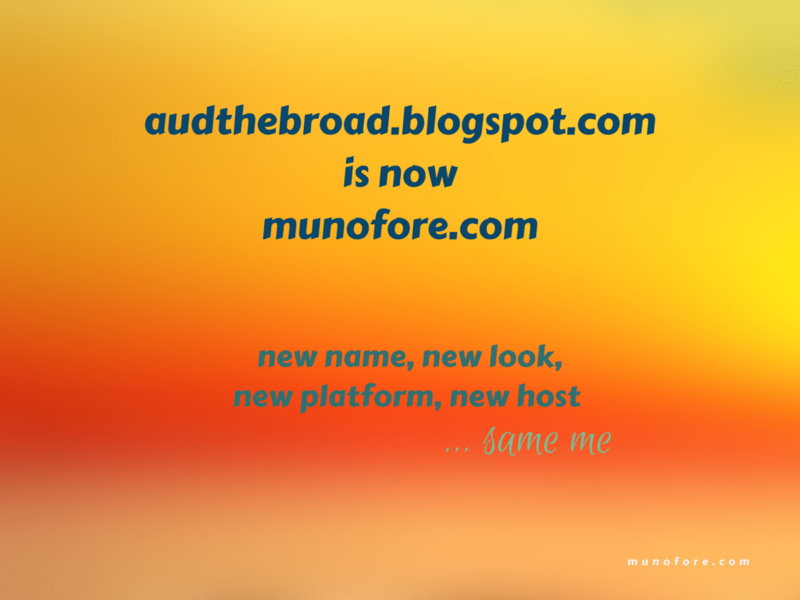 If you have questions on the process send me a message at Audrey at munofore dot com and I will be happy to tell you more about my experience and offer suggestions. So, now I am here. I am planning on more posts, plus hitting the Social Media trail hard for the new domain. I hope you come along for the ride.